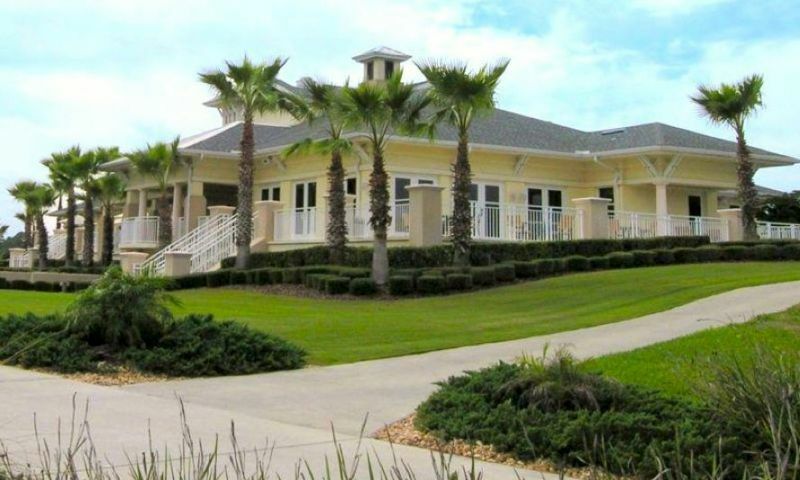 Grand Haven in Palm Coast is an active lifestyle community along Florida's Atlantic coast. This gated community offers residents world-class amenities that spread across two clubhouses as well as membership opportunities at the Grand Haven Golf Club. Multiple builders are represented in this community, offering homebuyers the choice of single-family homes, townhomes and condos in both new construction and resale options. Grand Haven offers an abundance of amenities for all of its residents. The premier gathering place for residents is the Village Center. Here, you can find an expansive fitness center, ballroom, sauna, day spa, and multi-purpose room used to host clubs and activities. Outside of the Village Center, residents enjoy a resort-style pool, seven lighted Har-Tru tennis courts, a bocce ball court, shuffleboard court, horseshoe pits, and a croquet lawn. There are also plenty of walking and biking trails as well as scenic lakes and ponds that can be enjoyed on a leisurely stroll. The Creekside Athletic Center is located by the north entrance of the community and offers excellent amenities. An indoor lounge and game room provides space for homeowners to enjoy each others company while participating in card games and organized events. Another fitness center is located in this location. Outside the Creekside Athletic Center residents enjoy a great selection of amenities. A pool and cabana provide the perfect place for relaxation as well as to enjoy the beautiful Florida climate. Those with a competitive spirit will enjoy a tournament sized croquet court, multi-use ball fields, as well as a volleyball and basketball court. There are multiple opportunities for memberships at the Grand Haven Golf Club. A full golf membership is available to the residents of Grand Haven and golfers who live outside the community. This membership provides unlimited use of the clubhouse as well as the 18-hole Jack Nicklaus golf course. An associate golf membership is only offered to Grand Haven residents and provides unlimited use of the clubhouse and limited golf course options. Lastly, the club membership is offered to residents of Grand Haven only. This membership offers unlimited use of the clubhouse however does not offer any golf privileges. Grand Haven started in 1997 and upon completion it will be comprised of 1,901 homes constructed by multiple builders. Single-family homes, townhomes, and condos are available in both new construction and resale options. All homes offer excellent craftsmanship and low-maintenance living so residents can enjoy all that the community has to offer. Condos in Grand Haven are available on a resale-only basis. They range approximately from 1,700 to 2,000 square feet with two to three bedrooms, two bathrooms, and a two-car garage. Townhomes by ICI Homes are available on a resale-only basis. They range from approximately 1,800 to 2,200 square feet of living space with two bedrooms, two to two-and-a-half bathrooms, and an attached two-car garage. Single-family homes built by Arthur Rutenberg Homes, Bellagio Homes, ICI Homes, Olsen Custom Homes, Red Carpet Construction, SeaGate Homes, and Skyway Builders offer a variety of floor plans that range from 1,528 to 4,350 square feet of living space. Homes feature two to five bedrooms, two to four bathrooms, and two to three-car garages. Homebuyers can choose from pre-designed floor plans or work with an approved builder to design the home of their dreams. Grand Haven provides its residents with an abundance of social opportunities. An on-site activities director plans weekly clubs and activities where neighbors can gather and mingle. Some of these clubs and activities include aerobics, bocce ball, basketball, volleyball, swimming, wine tastings, dancing or croquet. Whether you enjoy relaxing inside the clubhouse playing cards or you want to start your day with a fitness class, there is something for everyone at Grand Haven. Grand Haven is located on Florida's beautiful central Atlantic coast. Just off of Highway 95, the community offers easy access to surrounding cities such as Jacksonville, Daytona Beach and Orlando. Just outside the gates of Grand Haven, Palm Coast provides a multitude of shopping, entertainment and cultural attractions such as The Palm Harbor Shopping Center. Day trips to the many local beaches or hiking adventures to any of the surrounding parks makes the Palm Coast area one of the best in Florida. With so many amenities and home designs as well as plenty of nearby attractions, Grand Haven is a great community for almost any homebuyer. The Village Center is Grand Haven's central hub of social gatherings. Creekside Athletic Center is located by the north entrance and offers additional recreational activities for residents. Clubhouse - 17,000 Sq. Ft. There are plenty of activities available in Grand Haven. Here is a sample of some of the clubs, activities and classes offered here. Condos in Grand Haven are available on a resale-only basis. They range approximately from 1,700 to 2,000 square feet with two to three bedrooms, two bathrooms, and a two-car garage. Please Note: Floor plans are not available at this time. Townhomes by ICI Homes offer low-maintenance models with luxurious features. These homes are available on a resale-only basis. They range from approximately 1,800 to 2,200 square feet of living space with two bedrooms, two to two-and-a-half bathrooms, and an attached two-car garage. Please Note: Floor plans are not available at this time. Choose from one of the pre-designed models below or work with the builder to create your own dream home. Some of these single-family homes range from 1,528 to 2,700 square feet of living space. These homes have two to four bedrooms, two or three bathrooms, and an attached two or three-car garage. Homes feature large and luxurious master suites, open floor plans, and elegant fixtures. Choose from one of the pre-designed models below or work with the builder to create your own dream home. These single-family homes can range in size from 1,933 to 3,739 square feet with three to four bedrooms, two to three-and-a-half bathrooms, and two to three-car garages. Choose from one of the pre-designed models below or work with the builder to create your own dream home. Some of these single-family homes offer 1,979 to 4,350 square feet with three to four bedrooms, two to four-and-a-half bathrooms, and two to three-car garages. Single-family homes offer 2,304 to 3,822 square feet of living space. They have two to four bedrooms, two to four bathrooms, and two or three-car garages. Homeowners may customize their home with additional rooms, baths, or second floor living areas. These detached residences offer 2,410 to 4,272 square feet of living space. They have three to four bedrooms, three to four bathrooms, and two or three-car garages. These single-family homes may be customized to offer more living space. Choose from one of the pre-designed models below that offer 2,568 to 3,628 square feet with two to four bedrooms, two-and-a-half to four bathrooms, and two or three-car garages. Homebuyers can also work with the builder to create their own dream home. These custom single-family homes range from 2,540 to 3,695 square feet with three to four bedrooms, three to four bathrooms, and two or three-car garages. Homes can also be personalized to meet the styles of the homeowner. We are very pleased with our home here. Our favorite part of the house is our wonderful patio with a pool and great views of the pond and the golf course too. The location is very central to lots of different Florida cities offering tons of things to do and the coast is just a couple miles away. Living here offers us the opportunity to live a vacation-like lifestyle every single day. We love it! 55places.com is not affiliated with the developer(s) or homeowners association of Grand Haven. The information you submit is distributed to a 55places.com Partner Agent, who is a licensed real estate agent. The information regarding Grand Haven has not been verified or approved by the developer or homeowners association. Please verify all information prior to purchasing. 55places.com is not responsible for any errors regarding the information displayed on this website.